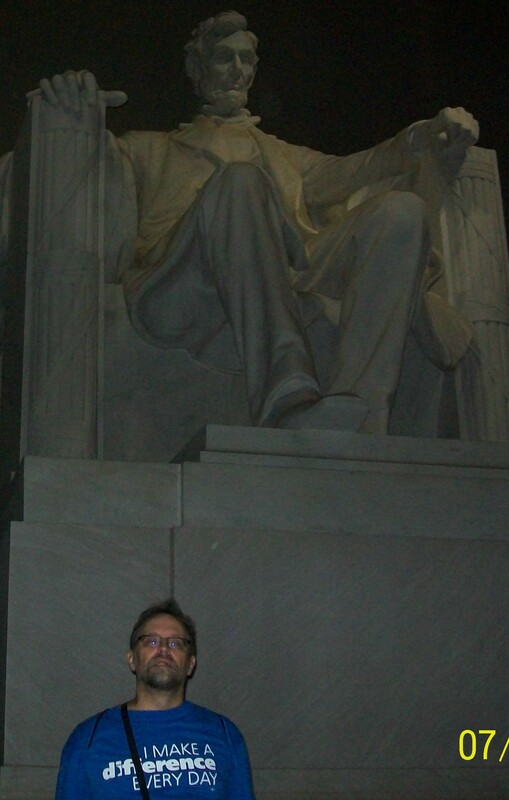 Of Jefferson, Lincoln, and the Folks There Now; Lessons from a Week in D.C.
From the Marchives: I originally posted this six years ago, and while a lot has changed, so much hasn’t. Eldest son Willi is now heading into his senior year in college as a political science major, youngest son Sam has just graduated from high school. The current political shenanigans in D.C….? Still a solid postscript to the Fourth of July. My wife, two sons and I recently spent a week in our nation’s capital – a first time experience for all of us. When the opportunity presented itself for me to participate in a teachers conference in D.C., we decided to make a family vacation out of the trip. As I had three-and-a-half days of conference to attend, we tacked on an extra day to the trip so I could see some of the sights. Sons Will and Sam, ages 15 and 12, respectively, are both history and military buffs, avid viewers of the History Channel, CNN, the Daily Show and Colbert Report. They possess a fairly sophisticated understanding of American government, how it works and how it is supposed to work, and were enthusiastic participants from the get go. It was our best family vacation ever. While I was conferencing, Amy and the boys did D.C. They made it into the galleries of both the Senate and House of Representatives, even witnessing a vote on the House floor. High school sophomore-to-be Will aspires to a career in public service and was fascinated enough with the processes of the House to spend more than an hour watching routine procedural matters while Amy and Sam toured other parts of the building and had a Coke to kill time before a late afternoon roll-call vote. His enthusiasm each night in relating his travels around Washington was palpable and infectious. While my family was touring the town, I was getting an education myself – aside from the seminars and plenary sessions. The hotel complex our conference was held at was huge, and with a conference of some 2,000 attendees, things were very spread out. Every place you went in the hotel complex were large, flat screen televisions, most of them tuned to CNN. Bouncing from seminar to seminar, meeting room to ballroom, I was covering a lot of ground, but also taking the time to watch the shenanigans of the various players in the whole ‘raise the debt ceiling’ debate. All in all, I was not impressed. Oddly, those big-screen images were so much different than seeing the same stuff in my living room in New Orleans. Knowing that my family was hanging out on Capitol Hill, understanding all that was unfolding just a short subway ride away was an unusual experience in perspective. Even the potential of seeing some of the players in the drama/soap opera on the street was an option, and at least one lesser-known congressman made an appearance at our conference, speaking to a delegation of teachers from his home state. Sidebar one: I snuck into the back of the room during his talk, and was more impressed with him than any of the ‘leaders’ popping up like a ‘Whack-a-Mole’ game at every flat-screen turn in the Marriot. But I was not in Washington to fret about the nation’s congressional leadership or lack thereof; I was there to be part of a presentation, then pick up some teaching CLUs. My ‘teachable moments’ (as the best ones usually are) were coming from more than just the seminars. Part of our family trip ‘deal’ was Amy and the boys holding off on some of the things I wanted to see, so we could experience them together as a family. My D.C. ‘wish list’ was headed by Arlington National Cemetery, and the presidential and war memorials: the Lincoln, Jefferson and F.D.R. monuments as well as those devoted to those who served in Vietnam, World War II and Korea, and the White House, if possible. While Amy, Willi, and Sam took in the Washington Monument and the back of the White House, they held off on the good stuff and I got my wish list. As with most things of this nature, pictures do not do any of it justice. Seeing it in person was incredibly moving. Looking at Lincoln sitting there in his chair, pensively looking out over Washington, towards the Washington Monument and the Capitol was impressive, but I was moved as much by the interior of the chamber, which features Lincoln’s words engraved in the marble. Reading the words of the man in a book or on a computer screen is nothing at all like seeing them written high on a wall of smooth, Colorado marble. 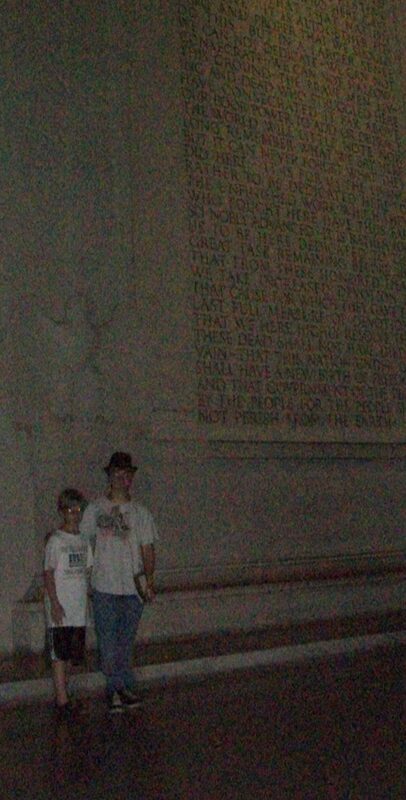 Chiseled on the wall to Lincoln’s right is his Gettysburg Address, while the wall to his left features his second inaugural address, each given to the nation in the midst of civil war. Both messages are profound in their eloquence and simplicity, and I left there with a renewed sense of pride and hope. A feeling that was relatively short lived. On the evening we returned to our hotel from visiting the Lincoln Memorial, I walked into the lobby while Senators Mc Connell and Reid were blathering about some aspect of the debt ceiling discussion, with each in his own way trying in vain to sound senatorial. ‘Trying’ is the operative word. After having just reread the Gettysburg Address, etched in marble soaring nearly fifty feet high, I was now confronted with the petulant children, grade-school playground-level discourse of our two key Senate ‘leaders’ whining about how nobody on the ‘other side’ wants to compromise or even acknowledge an opposing view. We can do so much better. I had just seen it. No matter what you might hear from your nightly sound bites on CNN or FOX and your Sunday morning news shows, keep in mind that Washington (or our country) is not a place built on a single ideology. Ideology seeks to conform everyone to a specific and very narrow set of ideas; aside from the broad concepts of liberty and freedom, this country has built itself from the ground up with a mixture of individuality and shared purpose – not a rigidly adhered to set of ideas from one individual or group. We have most always been able to find common ground. Washington, D.C. is a city constructed upon high ideals, grand ideas and sweeping visions. It was founded by men who shared much in their ways of thinking about how to build a nation and nurture democracy, but they also had vast differences and knew the art and value in compromise for the greater good. It is really the only reason we are here as a nation. Keep in mind it is not just the monuments themselves, or the men they celebrate but what they all mean to others; Marion Anderson sang and Martin Luther King, Jr. made his ‘I have a Dream’ speech from steps of the Lincoln Memorial. The reflecting pool between the Washington and Lincoln memorials has been the site of many dramatic protests and powerful moments. 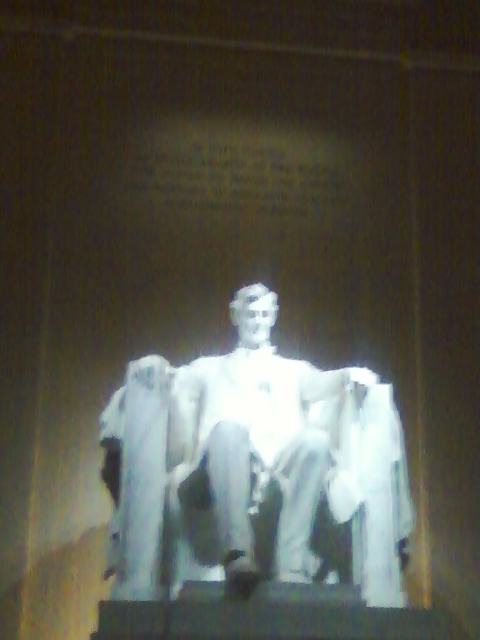 Such was my time with Mr. Lincoln. The woman who had graciously offered me the opportunity to attend the conference and trip spends a lot of time in D.C.; she told me before we left New Orleans, that of all of the monuments to see, the Jefferson Memorial was her favorite, and that she sometimes just goes there to sit and reflect. 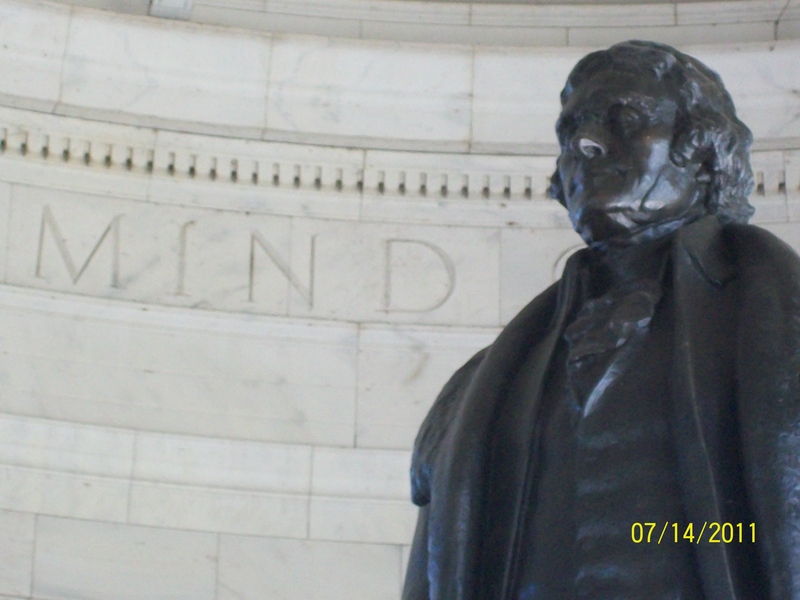 Jefferson holds a special fascination for a lot of people, and it his memorial was as high on Will’s list as it was on mine. As with Lincoln, the visuals of the monument are stunning and pictures do not do any of them justice; as with my visit to Lincoln, the words of Jefferson inscribed on the walls come powerfully to life. I came to Washington as an educator, and encountered one of the greatest educators in American history. Now if only our current leaders had absorbed some of Jefferson’s lessons – or even read them. The interior of the Jefferson Memorial features five of his most memorable quotations out of literally hundreds of choices they had. One is on the dome of the rotunda above his statue, four others are carved on huge, marble panels again soaring skyward between the giant pillars supporting the dome. In all five cases, Jefferson states his point, concisely and eloquently, without hyperbole or rant. Of today’s congressional leaders, I defy you to find any five compelling comments any of them has made or any ideas put forth that are worth commemorating. 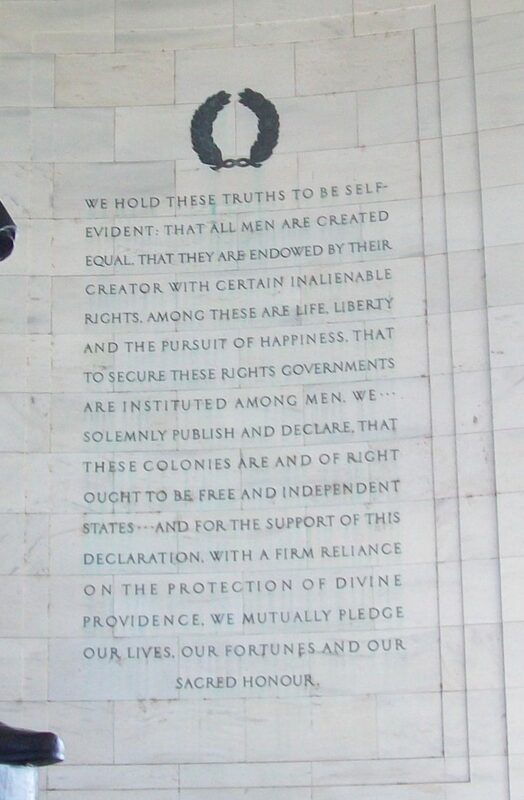 Jefferson would probably not fare well in today’s sound-bite climate. There is no vitriol, no sneering put-downs of his opponents. He spoke in clear thought, not rehearsed rhetoric. Ideas and ideals, not ideology. His words and ideas were and are righteous, but never self-righteous. That is a concept and skill our current leaders in Washington sorely need to learn, as their whiny finger pointing and pandering to their respective ‘political bases’ is a never ending video loop of self-indulgence and self-righteousness. There is very little being said by our leaders in Washington the week I was there that I could ever imagine being carved in stone. Most of it was barely worthy of highway overpass graffiti. Our congressional ‘leadership’ seems absent any sense of their responsibilities, and are sorely lacking gravitas beyond the sycophants that stand around them when the face they media. Boehner, Mc Connell, Pelosi and Reid, et al are the anti-Jefferson, the anti-Lincoln, at a time in history when we need anything but, which is sadly ironic. All around them, a five-minute limo ride away on any given day in Washington, are etched in marble and on bold, public display, not just words, but the wisdom and spirit that helped found this country, helped maintain it. The teacher in me thinks they all need to go on some field trips. We can do so much better than what we have. I have seen the proof; it’s chiseled in stone.